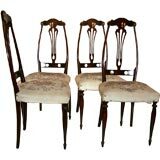 A stunning and useful set of neoclassical style game table chairs having dramatic and well designed lyre back details. 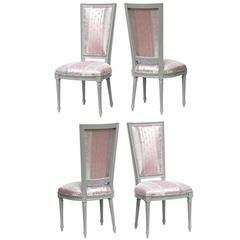 The sabre legged breakfast nook chairs are sturdy and ready for everyday use. 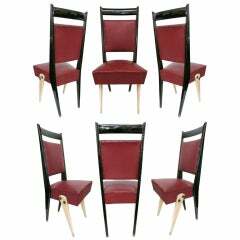 Crafted in the early 1920's, the Biedermeier influenced chairs are timeless and Classic look that is very now and current. Repairs to chips and glue repairs throughout the life of chairs. All sturdy, waxed to a high sheen and ready for everyday use Simply upholstered in a cream duck on 3/13/19. Could use fancier fabric. Nice set of Oregon pine chairs with twisted seagrass seats in beautiful vintage condition. 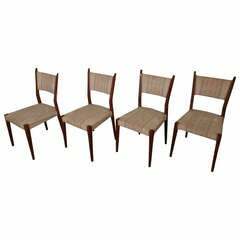 Set of vintage modern dining chairs designed by Paul McCobb for Calvin. Elegant angled back, tapered legs. (Please confirm item location NY or NJ with dealer). 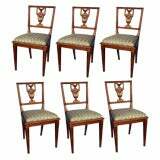 Set of Six Walnut Neoclassical Dining Chairs with urn carved back splat sitting on four tapering legs. Italian, Circa 1850. The drop in seats recently upholstered.